I have been struggling for a while to get the updated corona, suite of apps working. Every time I compile on my computer’s I get the following/similar error. Copyright (C) 2009-2013 C o r o n a L a b s I n c .
Please see attached jpg for further details. I have the early version of the android app working with out issue. If you require any further details please let me know. Its been a while since I've played with this. Each "project" that is check out of the GIT repository needs to use the hahlib library files. You need to copy "hahlib" into "C:\Program Files (x86)\Corona Labs\Corona SDK\Resources" so its available to ALL of those sub-projects - I tested this with the latest download 2015.2646 and it seems to do the trick. Brett many thanks for your quick response. I have down loaded and installed the latest version (3.0.0 Build: 2015.2646) of Corona SDK and placed the hahlib folder in the resources directory. Have had a very quick play and pleased to report I am getting further than I was. Unfortunately will not be able to test further until next week. Brett I can confirm that I am making further progress. App’s now compiles OK with Corona. I have tried the slider 2 widget, the slider is displayed on my lap top screen, when I move the slider I can see messages in the corona simulator output (bsc.sendText(dbzoo.livebox.kema:heating.Thermostat, 22)ect ect, but they do not appear in xfx message viewer. Is there anything else I need to set up for this to be received by the HAH. Yup because the code that puts the xAP message on the wire by default is commented out. doh! I must have been testing and forgot switch the comment around on those two lines. Brett I have removed the commenting out but still no joy, I had seen this and wondered why it was there. Can you please let me know if it works for you, if it does I will investigate further. Works just fine for me once I uncommented that line. Brett many thanks for persevering with me. I did not explain my problem very well. I can now see the following being received at dbzoo.corona.app (xfx message viewer) when the slider is moved. I was expecting an event to be generated to the text value of 16, which would update my thermostat setting. as you are getting a xap message directed at you end point it would suggest an issue with your endpoint handler. Can you post your script that handles the thermostat? Hi Garry the applet I am using is the one you helped me with many moons ago. I have modified it to fit my requirement’s. Temperature, thermostat and status are held in a cfg file. Many thanks for your and Bretts help. Garry apologise in my haste I did not read and digest your post before I commented. Hopefully the applet below is not too far off the mark. The lines I have added are highlighted in italics below. I have borrowed this from another post on the forum as I am not sure of the exact syntax required to receive and pass on the incoming temperature text value. Please excuse my lack of lua expertise, I do not normally raise a post until I have thoroughly researched the forum exhausted my limited knowledge. Garry I have had two major computer problems this week, CPU failure on our house server due to fan failure and to compound this, I was infected by a nasty virus while installing Flash software on a replacement machine. Luckily I have backups of most files. Please bear with me as I will not be able to test your recommendations until next week. Kema, I had to clean up a friends computer from nasties a few days ago I found this useful "windows defender offline"
Brett many thanks for the link. Garry I have followed your instructions in your post but still cannot get it working. When the slider is moved I can see the following message in XFX corona/demo. This has an extra line "state=on" which I do not get from the slider xfx viewer. Have no idea if I am going in the correct direction with this comparison. The state should be there that's a bug in the slider code. Very odd if you do?! Success, but new can of worms !!! Brett, success adding state "on" has fixed the problem. But I now have a new issue. Please see below. Garry you are correct on both counts in my example. It should have been “target=dbzoo.livebox.kema:Heating.thermostat” and “19.5”. I had too many xfx windows open at the same time and could not see the wood from the trees, will be more careful in future. When the slider is moved I get the following error, I have always had the Helvetica Font issue, this does not seem to cause any issues. Copyright (C) 2009-2015 C o r o n a L a b s I n c .
Warning: could not load font HelveticaNeue. Using default font. Many thanks to you both for you perseverance in helping me resolve this. What is sending this xAP event? Is that something from the someother piece of code ? Its not formed correctly and the slider is not handling it (another bug there too). There are several things wrong with the body. See how its looking for output.state.1 but it does not find it so it gets "nil" consequently that causes a problem. WAIT My BAD this is an xapBSC.event not a xAPBSC.cmd - so output.state is correct. You just need to add that little bit of code then. ARRGH double bad.... just remove the .1 this call is for an xAPBSC.event - its a coding bug. I am slightly confused by your last post regarding removing “.1”. If I leave in “.1” all seems to work OK. If I remove “.1” then I get a similar error as before. Lets consult ye specification on BSC shall we. Events should be "ouput.state" or "input.state" removing the .1 is correct. If its breaking then that is different problem that needs addressing. You need to post the xap packet that is breaking it. Brett here is the error I am seeing in the corona simulator output. can you please post your scene4.lua file and the exact error message you are getting. also cooy the related xfx xap messages that you see, both cmd and events. I am using the slider 2 app, which I have adapted to be used in the multi scene program. Please find attached to this post. This is the XFX message seen at corona. 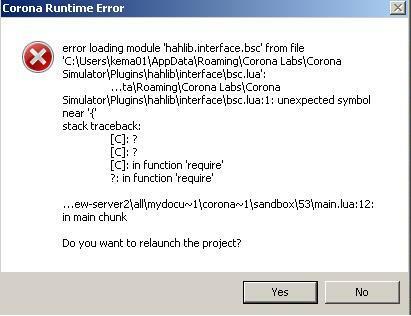 I am not quite sure what you mean by the exact error message, as I have already posted the run time error message in the corona simulator. Do I need to capture some sort of debug message. As you are aware my coding experience is at the embryotic stage. You are getting an error on line 74 as line 73 has defined a different variable. Variables in LUA are case senstive. Look at these lines carefully. As Brett says, your earlier error message was pointing you to the issue. I have no idea how this happend, as I just cut and paste from the slider 2 main into the scene 4. I could see there was a problem with line 74 but not the problem itself. This is exactly my issue I lack confidence and knowledge, but am learning all the time. If you dont mind giving me a little more assistance please with scene 4, I would be very grateful. I have an issue when I move to a new scene after previously selecting scene 4, where by the slider is super imposed under/over the newly selected scene. Also is it possible to step in .1 of a degree instead of 1 degree. The scene problem is due to the fact you have not added the slider into the scene's view. defined you just forgot, or didn't know, that you must insert displayables into this object. Thanks for the pointers, will look into this further.